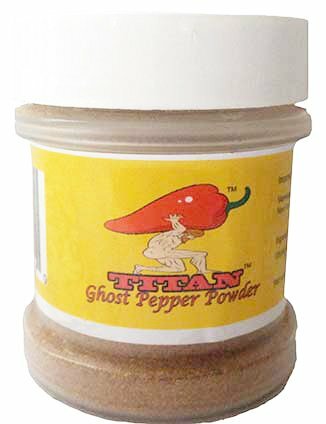 Titan Peppers - Ghost Pepper powder, hot peppers is what we do! Imported directly from India this finely ground 100% authentic TITAN pepper Bhut Jolokia ghost pepper powder is very hot! Use sparingly and with caution. Great for chili or to heat up any dish. Each bottle has a built in sifter for easy application. Do not eat if you have a heart condition, respatory condition, are pregnant or under the age of 15.